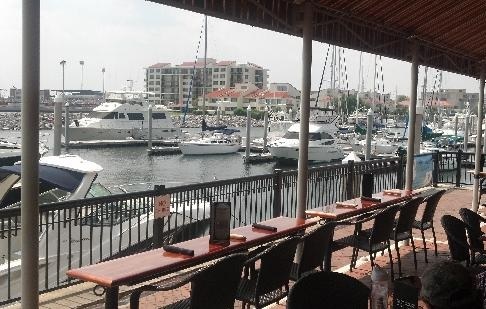 For those of you who don’t see our Facebook posts and thus haven’t seen our upcoming event, please come join us at Jaco’s Bayfront Bar & Grille tomorrow ( Friday, June 23rd) from 5 to 7 PM. Tropical Storm Cindy is supposed to be spent by then and the sun should make an appearance, so come on by for cocktails and conversation. After six months away, we’d love the opportunity to reconnect with friends and family. Also, an aspect of cruising that we’ve come to enjoy is the social side, with its gatherings for sundowners and pot lucks. We’re not sure why folks here in the marina don’t get together occasionally. Let’s do something about that! This entry was posted in Uncategorized on June 22, 2017 by Robert. There’s a lot of time to think about things when you’re spending 32 hours motorsailing across the Gulf. 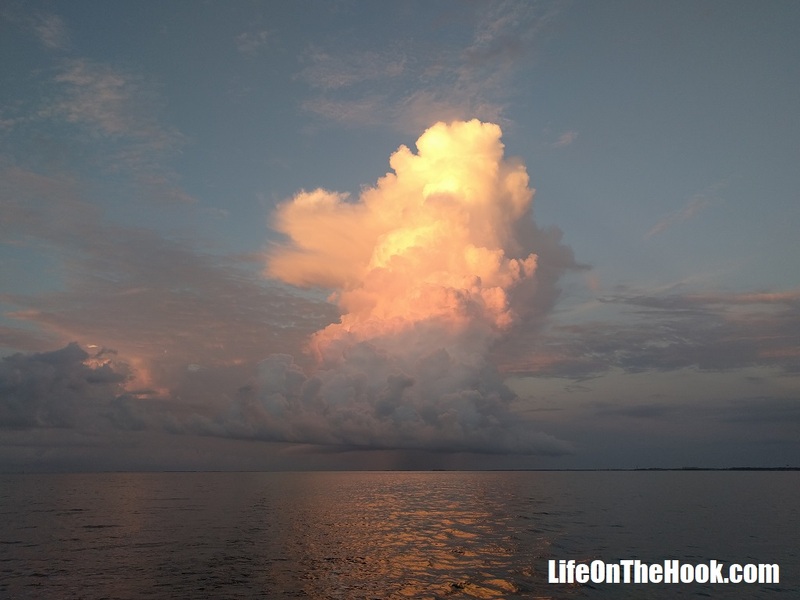 One of the many thoughts that crossed my mind during our recent jump from Clearwater, Florida to Port St Joe was the issue of picking a suitable weather window for offshore travel. The criteria for planning a comfortable and thus enjoyable ocean passage is a topic I wish we had known more about before setting off on our Life On The Hook™. 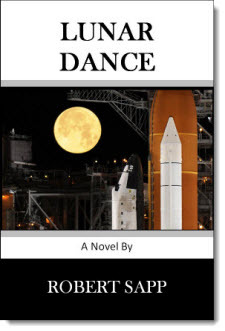 But there’s no teacher like experience, and after over a dozen offshore passages of a hundred miles or more, many involving the crossing of a major ocean current, we’ve come up with a list of criteria that we apply when determining whether or not to make a jump. This list reflects our priorities and ours alone. You may have or learn to develop your own list of what’s important to you. But since it’s always good to share knowledge and experience, I thought we’d pass along what we feel makes for the most comfortable passages. Number one on our list by a wide margin is sea state. When we first started cruising, I’d have considered the wind forecast to be the top concern, but something we’ve learned is that the winds don’t matter if the sea state doesn’t work. When making a go/no go decision, we’re looking for forecast seas of one to two feet. If everything else is perfect or we absolutely have to get moving (which seldom happens because as cruisers we don’t travel on a schedule), then we’ll consider two to three foot seas. But if we see that the forecast calls for three to five feet or more, then forget it, we’re staying put, even if the winds and weather are favorable. High seas make for a miserable passage, which often means missing out on an otherwise nominal weather window because the seas are still too high from a previous weather system. Now we’ve met some cruisers that will laugh at that. “Three to five foot seas? That’s nothing!” they’ll say. But here’s what we’ve learned. The forecast wave height is for the average sea state. If the forecast is for 1 to 2, you’re going to experience quite a few 3 footers. If they’re calling for 4 to 5, well, you’ll have more than a few 7 footers hitting you. And for us on our boat, this would be dangerous. Not because the boat can’t take it, but because the chance of one of us getting hurt increases exponentially with sea state. In 1 to 2 footers, it’s not too hard to move around, as long as we’re careful and always keep one hand on the boat. 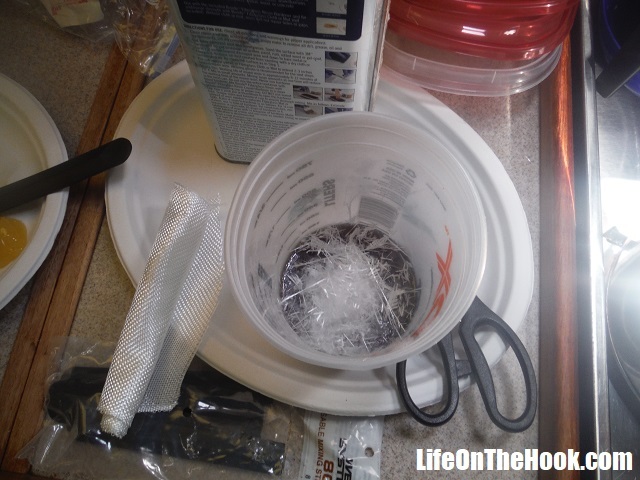 It’s possible to put a pot on the stove to make coffee or heat up a meal. Above 3 feet, the boat will start pitching and rolling enough that going below and moving around can be dangerous. The stove gimbal is hitting its stops, which means pots won’t stay put, so it’s strictly sandwiches and water rather than hot food and coffee. Spending hours holding on to the stern pulpit to keep yourself upright is tiring, and fatigue leads to loss of focus. Then you try to go below, miss one of the ladder steps, and fall into the cabin and get hurt while 50 miles offshore. Following 5 foot swells cause the boat to roll 25 to 30 degrees or more, and beating into them causes the bow to bash into the waves. It can be tolerated for a few hours. But a day or more? No thank you. Rhonda Caught A 24 Inch Little Tunny. 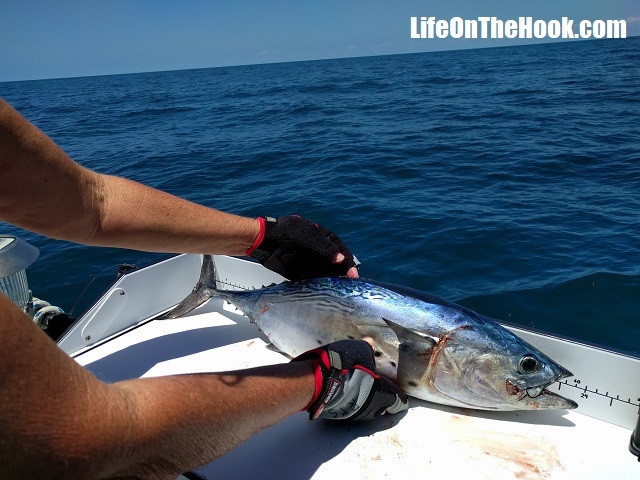 Related To Tuna, The Gulf Was Full Of Them. Next we look at forecast precipitation. We live under a 63 foot aluminum pole, and when we’re out on the ocean, we’re the tallest thing by far from us to the horizon. So if they’re predicting thunderstorms, we don’t go. It’s just that simple. Much better to just wait it out in the marina or anchorage, where at least we’re not the only tall aluminum pole around. If the forecast is calling for showers, but not thunderstorms, then it comes down to intensity. A little light rain isn’t that big a deal, we have foul weather gear for that. But if they’re calling for moderate to heavy showers, we’ll probably stay put. It might be different if we had a full enclosure for our cockpit, but we don’t, and there’s only so many hours of standing at the helm in the rain that we can tolerate. If it’s not a day that you’d consider riding a motorcycle, it’s probably not a good day for a passage. 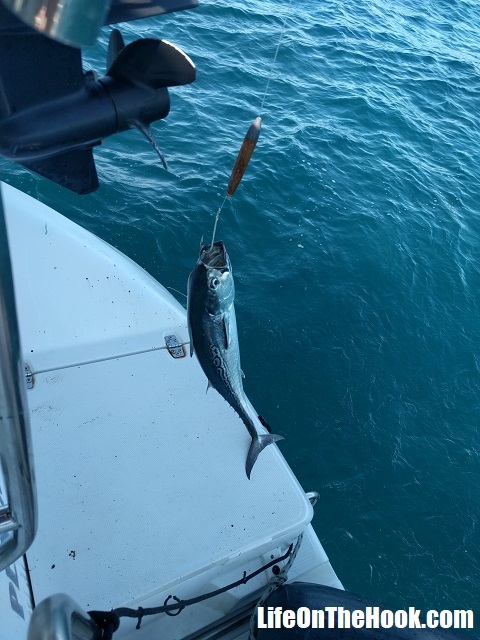 Another Little Tunny. Only 18 Inches, So She Let Him Go. Now we get to wind. You might think that as a sailboat, this would be higher on the list, but here’s what we’ve learned about wind in our 4,000 miles of travel. It almost never blows from the right direction at the right speed. It’s either too little, too much, or coming from the wrong direction. If we only traveled when the wind was right for sailing, we’d hardly ever go anywhere. So if the prediction is for force 3 or less (up to 10 knots), we’ll go, regardless of the forecast direction. We’ll consider going in a force 4 wind (11 to 16 knots) if it will be behind us, but we won’t go if we’ll be reaching into it, because the apparent wind will be in the 20+ knot range. Greater than force 4, we’re staying put. 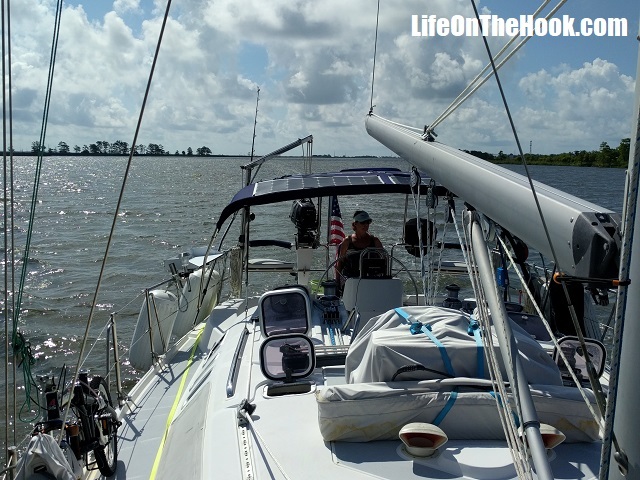 Even as seasoned a sailor as Bruce Van Sant, author of the cruiser’s bible The Gentlemen’s Guide To Passages South, says that there’s no point in traveling in anything higher that a force 3 wind unless you have no other choice. It’s not relaxing, it’s hard work, people can get hurt and boats can break, and that’s not why we cruise. It’s probably different if you have to be at work on Monday, but cruisers don’t sail to a schedule. We just don’t do it. 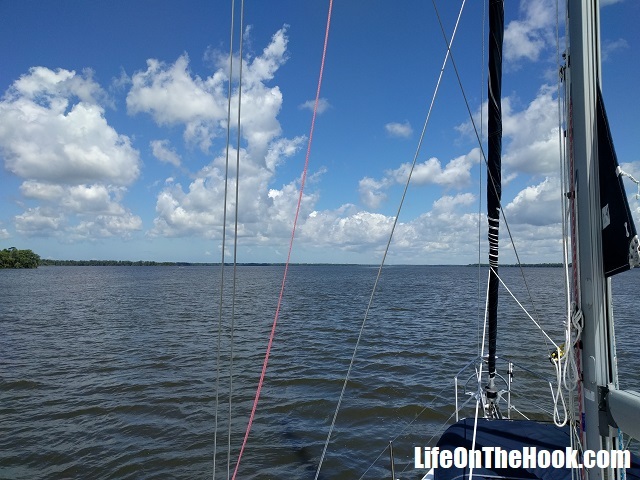 So here’s the dirty little secret about sailboats, at least as far as cruising goes. Seventy-five percent of the time, you’re going to be motoring or motorsailing. Only a quarter of the time or less will you actually be able to arrive at your destination under sail alone. So yes, make sure those sails and rigging are in top shape, but also consider adding that three bladed prop, make sure your engine alignment is spot on, and do whatever propulsion system upgrades you may need in order to feel confident about running your engine for days at a time without a break. You’ll probably need a spare alternator or water pump much more than a spare sail. After considering the sea state, rain and wind, we like to take a look at the moon phase. Since you only get one full moon a month, it’s not something you can really factor in to your decision to go if everything else is in alignment. You just take what you get. But let me tell you, spending a night at sea in conditions that require sail adjustments or movement about the deck is infinitely better when there’s actually some light to see by and you’re not totally dependent on a headlamp. And it’s extremely comforting to actually be able to see a horizon at night, especially when crossing a shipping lane full of fast moving freighters or threading through a pack of fishing trawlers. The total darkness of an overcast night with a new moon, where you can hear the waves but can’t see them because the world beyond the lifelines is invisible, can be unsettling. So we like to make long passages during times when the moon is at or near full. Yes, the stars are breathtaking out in the middle of a calm sea on a clear, moonless night while ghosting along under sail in a gentle breeze. But in 14 months of travel, we’ve experienced exactly two nights like that. Every other of the more than a dozen overnight passages we’ve made have been cloudy, dark, rolly, windy, or some combination of the four, while the steady drone of the engine numbed our ears and physically wore us down. RIver Cruising. We Saw Alligators, Manatees, Turtles And Ospreys. 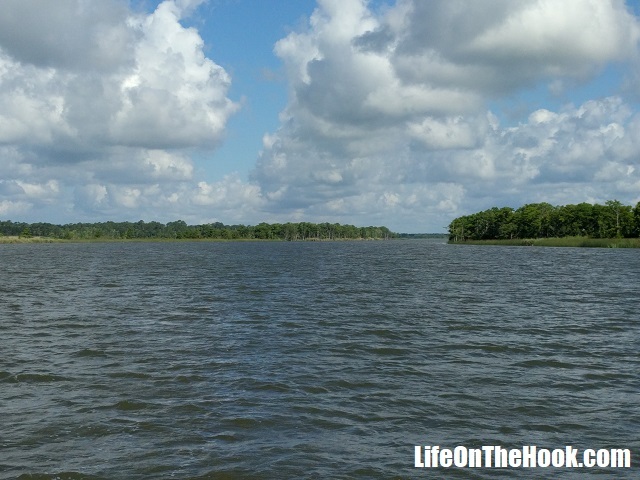 So those are the criteria that we evaluate when determining when to head out onto open water. If you’re one of those people whose response is “we go regardless of the conditions,” or “we sail through thunderstorms and force 7 winds all the time,” I have one simple question for you. Why? I’d like to hear what motivates you to do such a thing. Since much of this discussion probably makes ocean passages sound less idyllic than you may have pictured, some of you may be asking the question, “Is it worth it?” My answer is “Yes, it is.” Passages can be a trial, a measure of determination and a test of endurance. But the return on the investment is that we get to spend weeks, even months visiting some pretty amazing places that most people are lucky to experience for just a handful of days. And in the final balance, that’s what cruising is all about. This entry was posted in Where?, Why? and tagged Crossing the Gulf, Passage Planning For Cruisers on June 12, 2017 by Robert. Cruising /krōōz-ing/ verb: The act of performing boat repairs in a series of exotic locations. We’ve learned that when it comes to maintenance and upkeep, a good rule of thumb is to expect to spend about 10% of the purchase price of your vessel on annual maintenance. If you’re currently only using your boat on weekends and for an occasional vacation trip, you might think that that’s a bit (or maybe a lot) too high. But cruisers use their boats daily and use them hard, and things break or wear out with surprising frequency. We’re now into our 14th month of full time cruising, and our experience tells us that 10% might even be a little light. We have things onboard that we’ve already had to replace twice. And that’s for a boat that was lightly used and thoroughly refitted before our departure. So for you future cruisers out there, ensure that your proposed budget has that 10% maintenance line built in. Trust me on this one, or you might find your cruising dreams unexpectedly cut short. 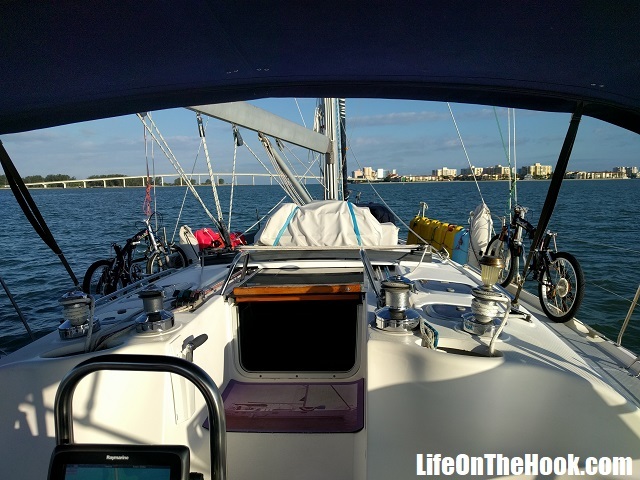 So there we were anchored between Key Largo and Rodriquez Key, preparing to get underway for Marathon and the Moser Channel. Rhonda started the engine, while I went up on the bow to raise the anchor. 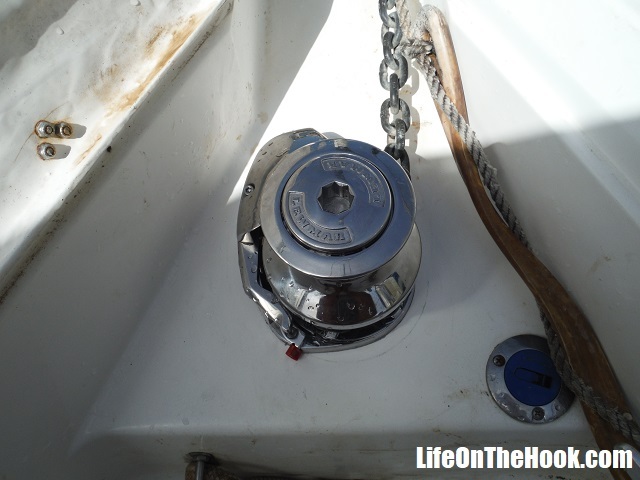 I stepped on the anchor windlass “up” switch, and the rode began paying in as usual. Suddenly, the windlass let out a groan and quit. After years of faithful service, it apparently decided it no longer wanted to participate in our adventure. I had to resort to pulling in our 55 lb. Mantus anchor and chain rode by hand. 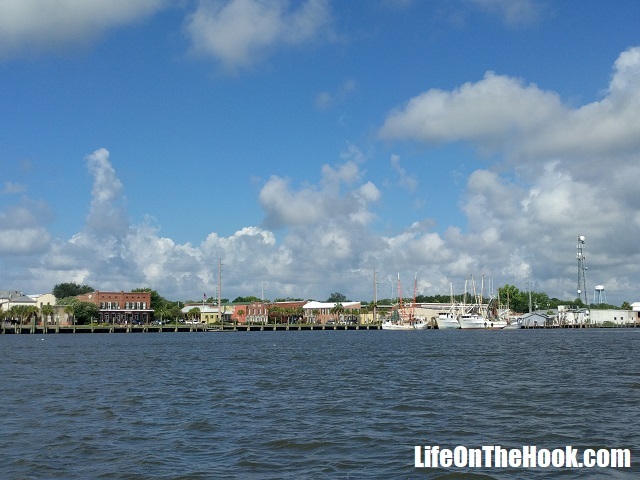 We knew we had between two and three weeks of coastal cruising ahead of us in order to make it back to Pensacola, much of it spent in anchorages. That meant a lot of anchoring. And I didn’t think my 59 year old back could play human windlass for that long. We had to have a functional windlass, which means fixing it wasn’t something I could put off until we made it home. So our quick touch and go in Marathon turned into a maintenance stop. 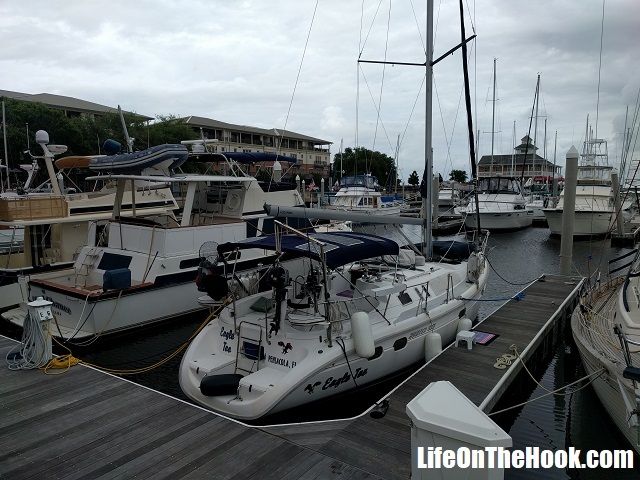 We called Skipjack (formerly Sombrero) Marina, where we knew Scott the dockmaster from previous visits, and he found us a spot along the bulkhead (close to the pool!) where we could plug into shore power and work on our problem. I pulled the windlass unit out and started overhauling it, and finally got it to reluctantly pull the anchor up. Unfortunately, it would trip the circuit breaker every five to ten seconds. This meant that in order to weigh anchor, Rhonda would have to stay below in the cabin to continually reset the breaker, while I pulled the anchor up a few feet at a time. While this may have gotten us home, I decided this just wouldn’t do. 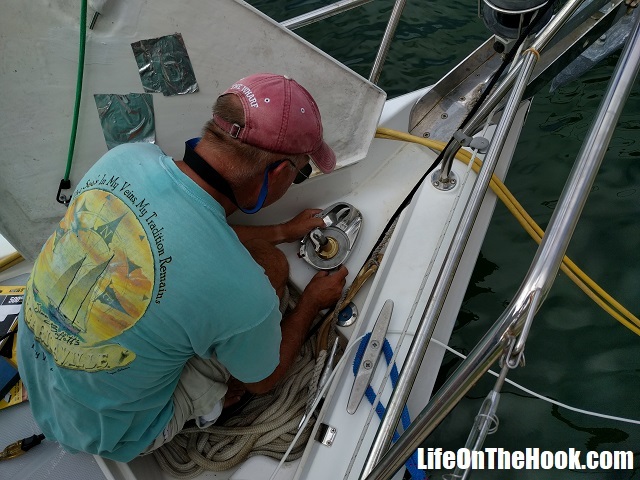 Sometimes things happen out here that require you to move the boat right now, and having to nurse a sick windlass that would need 10 or 15 minutes to weigh anchor was just too risky. It was decision time. 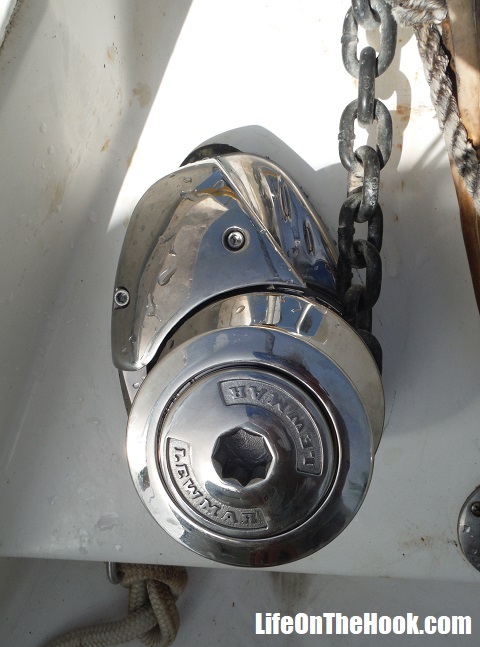 The old windlass was a 20 year old Simpson Lawrence Sprint Atlantic, a model that was no longer made. Even if I could get it working again, it probably wasn’t going to get any better in time, and parts were extremely rare. It looked like we were shopping for a new windlass, to the tune of about two boat bucks. We tried to look on the bright side. If the windlass had failed just a few weeks earlier, while we were in the Bahamas, replacing it probably would have been near impossible. But since it had had the consideration to wait until we were back in the Keys, we were able to jump online and order a replacement from Defender and have it shipped second day to the marina. Eagle Too just seems to look out for us that way, for which we’re very grateful. Since Lewmar had purchased Simpson Lawrence some years previously, I checked their website for guidance. The recommended replacement unit for our old Sprint Atlantic was the Lewmar V2. 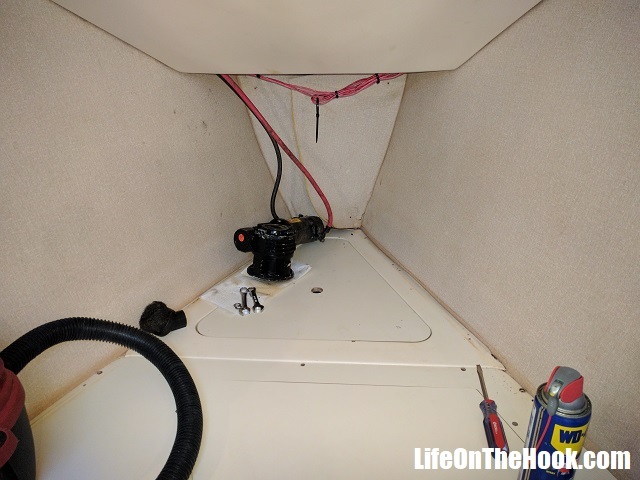 My hope was that it was similar enough to our old unit that it would drop into the existing mounting holes and fit under the anchor locker lid. Alas, this was a boat job afterall. Which means that there’s always something unanticipated that has to be dealt with. While the motor and gearbox fit in the existing space and the mounting bolt pattern was the same, the new deck unit was more compact than the older one. The hawsepipe, or the hole in the deck through which the windlass drops the anchor chain into the anchor locker, didn’t align. Which means it was going to take some glass work to make it right. 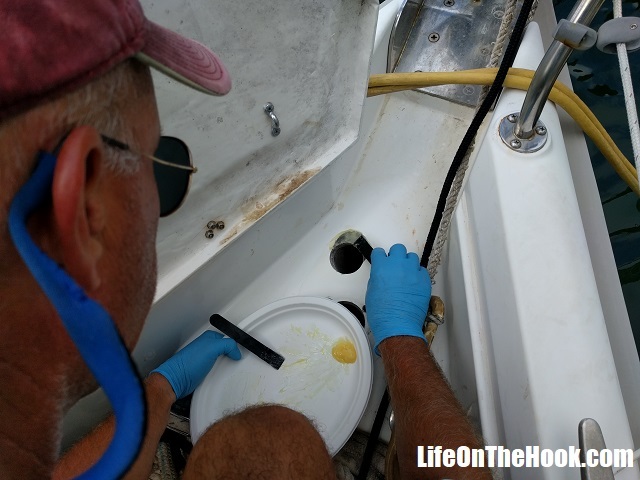 Now any properly outfitted cruising boat should have some basic fiberglass repair supplies onboard, because you just never know when you might need to do a quick glass job. I chopped up some fiberglass mat and stirred it into about four ounces of catalyzed resin to make a thick slurry, and filled in the forward third of the existing hawse pipe hole. After an overnight cure and some sanding, a quick skim coat of some thickened epoxy and a little more sanding reduced the size of the hole to the right size for the new windlass, and gave me a nice flat surface to ensure the bedding compound (butyl rubber, naturally) would provide a watertight seal. It still needs a little Gel Coat to make it perfect, but that can actually wait until we’re home again. Then there was the little matter of needing an additional electrical cable to power the motor, as the old windlass used a pair of 2AWG battery cables and this one required a third. So it was off to West Marine for 25 feet of battery cable. And of course, the windlass solenoid and breaker had to both also be replaced. But after about five days, we once again had a working windlass, which wonder of wonders, just fit exactly under the anchor locker lid, even though it was a full inch and a half taller than the old one. 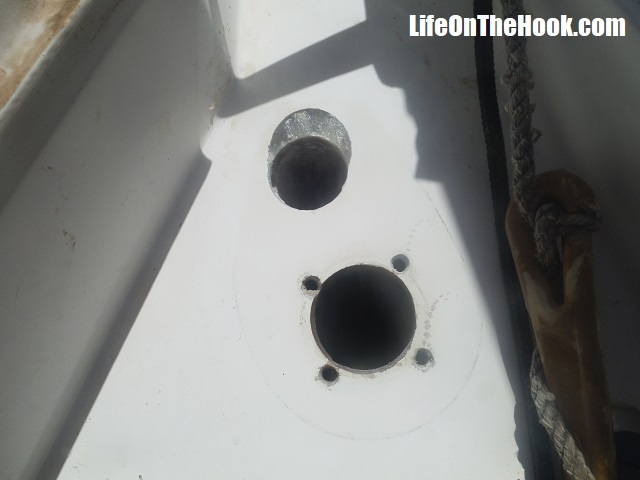 I just knew I was going to have to cut a 5 inch hole in the anchor locker lid for the capstan to protrude through, and whooped with delight when I finally had everything bolted together and attempted to close the lid and it actually shut! Then the level sensor in our shower sump box failed, but that was only about a 30 minute fix, since we had a spare sensor onboard. And then we noticed water in the bilge, which isn’t right since ours is bone dry. 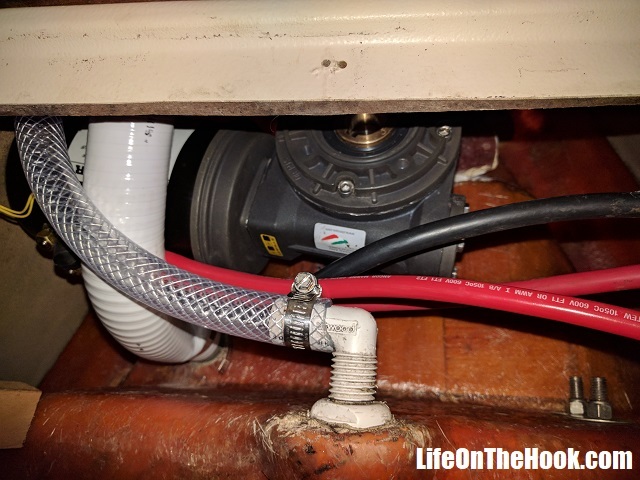 I traced it to a failed air conditioner condensate venturi, which was allowing the AC condensate to dribble into the bilge rather than be sucked overboard as it should. So since I was already working on the sump box, I took a day and yanked out the venturi and plumbed the AC drain pan to the shower sump. It’s a job I was meaning to do anyway once we made it home, and the air conditioner seems to be working so much better now that the cooling water flow is no longer restricted by the venturi. So our quick pit stop in Marathon turned into a $3,000, week long mini-refit. After seven days of living in a torn apart boat, we were tired and cranky and so very glad when we were finally able to get the cabin put back together and just relax for a couple of days. As we enter June (and the beginning of hurricane season), we’re close to halfway through the year, and we’ve spent about half of our anticipated annual maintenance budget. So our advice is that unless you’re starting out with a new boat that’s still under warranty, make sure you set enough aside for those inevitable repairs. And remember, that 10% figure is just for parts and materials. If you have to pay someone to do all of these basic maintenance tasks for you, you’ll need to at least double that amount! This entry was posted in How?, Why? and tagged Budgeting for Cruising, Cruising Maintenance, Cruising Maintenance Budget, Save Enough For Repairs on June 2, 2017 by Robert.